how are my darlings today? good i hope! today is very very happy day for meee, it's phillip's and i's one year anniversay...eepp AND it's my little sisters big 18th birthday too! how much more amazing could it get!!! i spent most of the day getting the finishing touches on both their gifts, eep they are so darling! i'll have to post pictures. phillip and i are celebrating our anniversary tomorrow and my momma is having champagne and appetizers for us and then we are going to Ruth's Chris Steakhouse for romantic little dinner, yummm!!! i really like your outfit! i love those jean dresses! btw i am in love with your hair! soo jealous! oh my gaaah you look STUNNING!!! your hair, your eyes, that dress, the belt, and wedges...it's just all workin giiiirl!! and I love the backdrop of gorgeous pink flowers!!! woow. I love these pictures! You look great as always :) Happy anniversary & bday to your sis! You are beautiful. Your denim dress is lovely, and I adore your hair...so gorgeous! 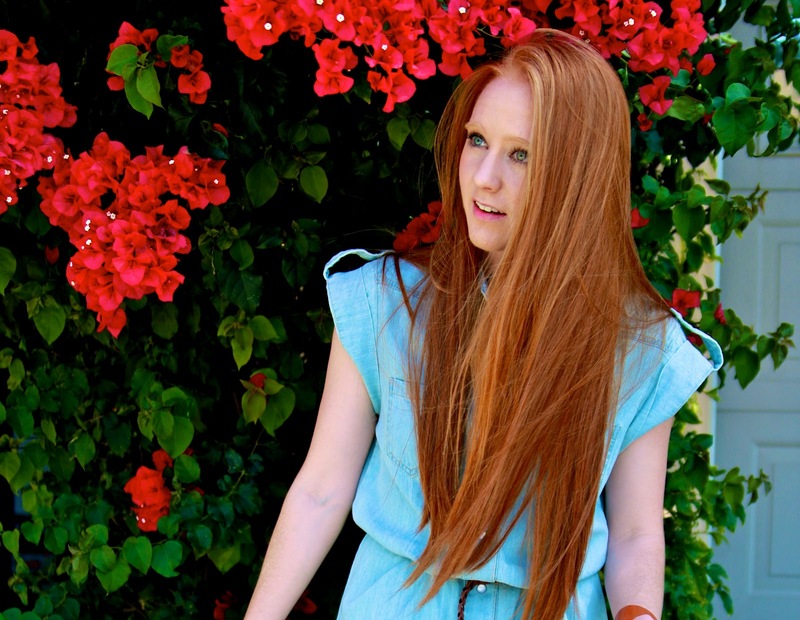 Great blog - your hair is amazing and I love this dress. Happy anniversary! And happy birthday to your sister! (Man, today's everybody's birthday!) You really do look stunning in this post, I can't get over your hair! your hair is SO long and gorgeous!!! lucky girl! I LOVE your hair!! Its soo long and pretty! Hope you can check mine out! Great outfit and your hair is so beautiful!! You are STUNNING! You really are! I absolutely adore those clogs of yours! this denim shirt-dress is so cute. the photos are so cute and fun. congratulations! sounds like you have a fun day in store! your hair is freaking amazing!!! Great pictures, your dress is so cute and you are gorgeous loving your hair so much! enjoy your anniversary date! love the photos, i especially love the floral back drop - so pretty! you're gorgeous! the dress looks amazing with your beautiful hair! love so much your hair!Would you like to follow each other?Let me know, I'll be waiting for you! Happy birthday to your pretty sister and happy anniversary to you! Love your casual chic dress and wedges! Have fun! You are stunning love and your style is impeccable. I enjoy yours posts so much. You have such talent. So Happy I stumbled across your blog! Love the pictures! Your dress is awesome and so is the location! i love the denim dress! You are beautiful! This look is perfection! 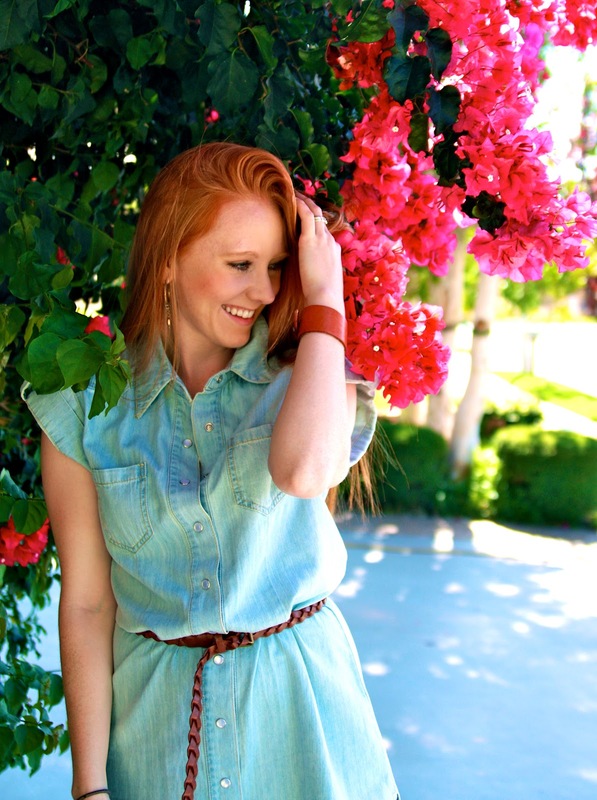 So in love with the chambray shirt dress - you look so cute! the blue of that dress paired with your fiery red hair is lovely, and your eyes just pop! beautiful!